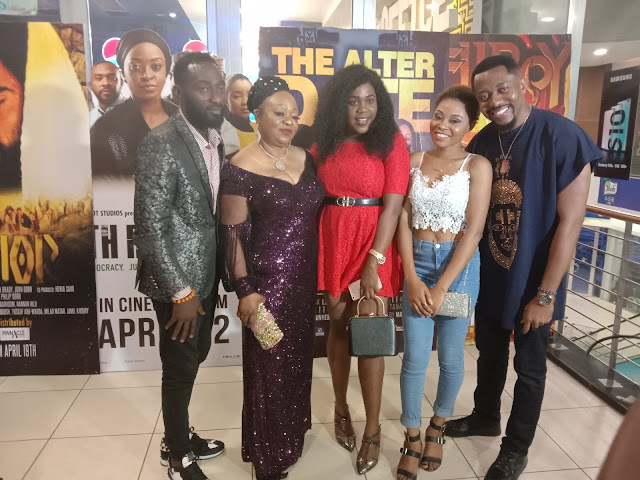 The official trailer for the movie ‘Away Bus’is finally here and after watching it, we feel it would be worth it to buy a ticket to catch its premiere on April 20th at the Silverbird Cinemas inside Accra Mall and West Hills Mall. According to GHbase,The movie ‘Away Bus’ is a star-studded one as it features lots of popular faces in the Ghallywood and Kumawood industry. At a press conference held in March attended by Ghbase.com also, Kofas Media announced that this film was a partnership between his company, Kofas Media and Old Film. The film features the likes of John Dumelo, Fella Makafui, Salma Mumin, Kalybos, Ahoufe Patri, Master Richard, Umar Krupp, Adjetey Annan, Moesha Bodoung, Too Sweet Annan, Yaw Dabo, Akuapem Poloo, Abeiku Santana, Kalsoume Sinare, Big Akwes, Akrobeto, Roselyn Ngissah, Agya Koo, Tracey Boakye and some other new faces. Two sisters (Salma Mumin and Fella Makafu) had no choice than to engage in a bus heist with the help of Kalybos to raise money to save their dying mother in the hospital. Tickets for the movie are selling at a cool Ghc50 and will premiere on Saturday, 20th April for those in Accra at the Silverbird Cinemas and West Hills Mall. For more info call 055 8501804 or 0558467542. It will also premiere on 21st April 2019 in Kumasi at the Kumasi Mall.